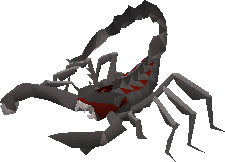 Scorpia is a Scorpion boss found beneath the Scorpion Pit within the deep wilderness. As Scorpia is a Scorpion, Scorpia kills will count towards a Scorpion slayer task. Outside of the Odium shard and the Malediction shard drops, Scorpia’s drop table is not very lucrative so it is rarely killed outside of Slayer tasks. The most common tactic to use at Scorpia is to farcast her with Magic using freeze spells. Scorpia is one of the few bosses in the game in which Freeze spells can be used effectively. As Scorpia has a low magic defence, you can successfully keep her frozen and farcast her. In this manner you can avoid Scorpia’s powerful melee attack which allows you to use the protection from missiles prayer to protect yourself from the ranged attacks of Scorpia’s offspring. Scorpia has a powerful poison attack which should be protected against with an antidote++. Her offspring also drain your prayer when they attack so special attention should be paid to your prayer points. At 50% health, Scorpia will spawn two guardians which will attempt to heal Scorpia. At this point you have two options. You can simply kill the guardians as they only have 70hp and are equally weak to magic – or you can freeze them and they will despawn after 15 seconds.